Long lines, rocking cover tunes, and prepping Ford Nation for 2014 marked the Ford family's annual barbecue. Media assembling on Weston Wood Road, outside Diane Ford's house. 1010 Newstalk CFRB conducted a live radio broadcast, with the mayor as a guest. Relaxing in front of the official Ford Nation hut. This way to Ford Fest, via Diane Ford's garage. Every party needs a sharply dressed man...in this case, PR guy/former mayoral candidate <a href="http://www.thestar.com/news/gta/torontomayoralrace/article/845033--mayoral-candidate-with-a-golden-ego">J.P. Pampena</a>. The beginning of a long night for the grill crew, who prepared 150 boxes of burgers and 45 boxes of hot dogs. Doug Ford addressing the media. Krista Ford and her boyfriend pose for the camera. Accompanied by press secretary George Christopoulos, Rob Ford arrives. 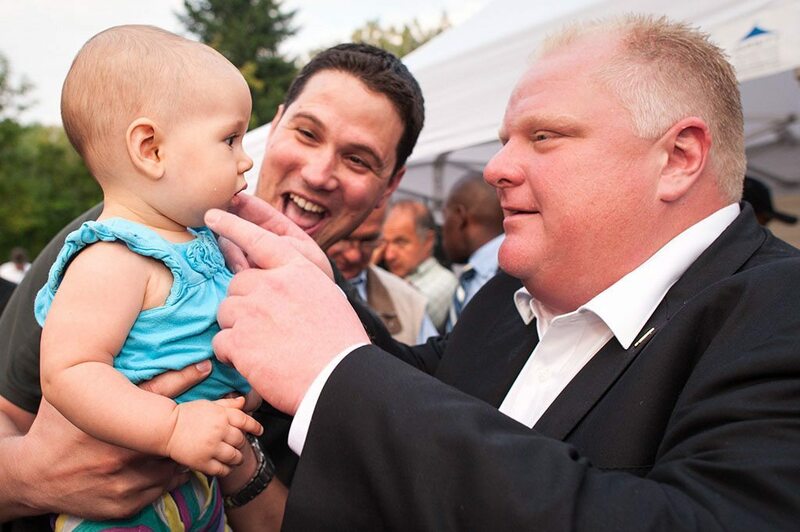 Every politician's favourite prop: BABIES. Rob Ford assesses future talent for his Don Bosco football squad. The swimming pool was sprinkled with rose petals for the occasion. While there was no full-fledged LGBT protest, some guests proudly displayed their colours. A beaming Doug Ford soaks in the good vibes of the crowd and the tunes of cover band Gently Bent (featuring city councillor Gary Crawford on drums). Diane Ford, mother of Doug and Rob. As Rob Ford has his Queen's Diamond Jubilee Medal straightened out, Ontario Progressive Conservative leader Tim Hudak praised Ford's frugality. Police directing traffic on Royal York Road, as guests make their way home at the end of the night. Rather than protest further, we scribbled our names amid over 5,000 other signatures from those who came to enjoy the Ford family’s hospitality, as matriarch Diane Ford threw her Etobicoke home open to the entire city in an annual tradition. Apart from disputes over people cutting into the burger line, it was one of the evening’s few confrontations. The laid-back atmosphere—which mixed die-hard supporters, neighbourhood families, politically engaged residents who often disagree with Ford, the curious, and the media—must have been a relief for the Fords after a rocky week in court. A Facebook-organized LGBT gathering didn’t materialize, though people wearing rainbow colours danced to Councillor Gary Crawford’s (Ward 36, Scarborough Southwest) hire-worthy cover band, Gently Bent. The relaxed approach applied to the food line, whose mass disorganization would have made an anarchist smile. No one knew where the queue began, so people joined in wherever they could without offending others. We let in two elderly women who sweetly looked around to make sure nobody would call them out. As we waited, we observed several requests for security to deal with line jumpers and one loud public shaming by the pool. The line snaked around the backyard, threatening to form an infinite circle that would never lead to the lone barbecue pit. Standing for over 90 minutes for burgers and hot dogs provided time to observe the Greco-Roman-inspired lawn décor and the rose petals floating in the pool. A beer and wine station along the way offered relief, though some trouble with the tap produced cups that were 70 per cent head/30 per cent brew. Plenty of kids were on hand, enjoying the food or the balloon animals made by a roaming man in a tux. They were also encouraged to lend vocal help to Gently Bent’s rendition of “Another Brick in the Wall.” It was unclear if that song accidentally or intentionally commented on the depths of the mayor’s knowledge of municipal law. What stood out most at Ford Fest was the family’s genuinely welcoming nature—including personal thanks from Diane Ford, who went table to table to say hello. For all his faults as a public official, Rob Ford’s ability to connect with people on a personal level is what has gotten him as far as he has, and its merits are real. However and whenever he leaves office, it’s at least one (and possibly the only) thing future mayors may want to adopt from his tenure.